Designed by experts in lamp-ballast compatibility, the Eye Hortilux Gold Series e-Ballasts provide consistent, stable power to the lamp for high intensity and a quality spectrum. 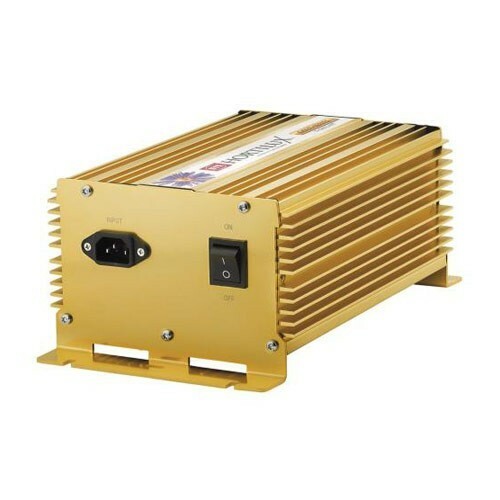 These ballasts feature lamp detection for safe operation (open & short circuit protection), soft start technology, silent, high frequency sine wave operation, cool operating temperature and a long range igniter (up to 70 feet). Designed to extend the life of your lamp, the Gold Series e-Ballasts operate Hortilux Super HPS, Hortilux Blue and Hortilux e-Start Metal Halide Lamps. Generator ready, flip box ready and completely sealed against dust and moisture, these ballasts are also UL listed for fire and electrical safety. 120V cord included (240V cord may be purchased separately).